Who doesn't like an optical illusion? If this is something you like, then this block is a great choice. It is a simple block to construct and is made entirely of half square triangles. I have designed the block as a four patch, but you can easily sew it together row by row as well. 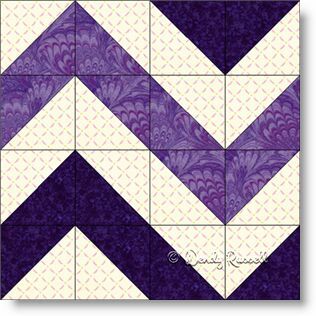 By rotating or flipping the block you can create any number of interesting patterns for your quilt. The sample quilts illustrated show two very different versions using only the one block, multiple times. Why not try your hand at creating an interesting layout of your own?